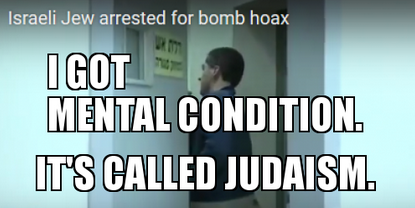 Israeli authorities on Thursday arrested a 19-year-old Jewish dual American-Israeli citizen and his father for being the suspected source of the rash of anti-Semitic bomb threats against Jewish community centers in the United States, Europe, Australia and New Zealand. The Jerusalem Post and Haaretz report the arrests follow a months-long secret investigation that revealed most of the threats against Diaspora communities and organizations came from Israel. Curiously, none other than President Trump seemed to have a inkling that this investigation was coming to a head. He hinted three weeks ago at the “novel concept” of a false flag or conspiracy and was immediately subjected to the standard, overused “anti-Semite” epithet by faux media Washington Post and elsewhere. Additional various Judaic mouthpieces, tweeter junkies and talking heads tossed out more slurs about a “wave of extremist antisemitism” at loose in the land. Mr. Rosenberg’s tweet (below) is right about one thing: Threatening children at community centers is a particularly odious offense. And the unnamed Shlomo did this on a large scale (100 threats) and for some time. “Anti-Semites” were also accused of toppling old Jewish cemetery tombstones. Who would do that?? Sure enough, an answer finally came: nobody. It was due to weather, wear and a lack of maintenance. Whodathunk? Rosenberg owes “anti-Semites” an apology. No self-respecting anti-Semite worth his or her salt would cowardly threaten children and the dead. Are there people who dislike Jews or some Jews? Certainly, but only seriously neurotic people and/or scammers would think or suggest they are coming for kids or burial sites. 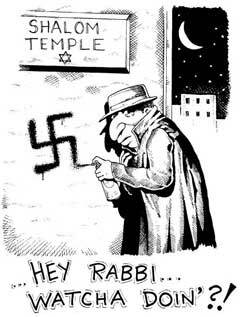 About all Rosenberg and his ilk should really anticipate are some insults and derogatory memes, as illustrated at right (identified as “hate speech”) about Jewish behaviors and perhaps running an alerting blog tag (not risk-free) labeled “Whatcha Doin’ There Rabbi?” In that tag, the unaware can find many stories of the hoax and dirty-tricks nature. Earlier in the week, there was another report about a fabrication involving a Jewish man painting swastikas on his own house. Recently two Northwestern students one hispanic, Anthony Morales, 19 and one Jewish Matthew Kafker, 18, vandalized the campus church with swastikas. Last year, TNN reported on nasty super troll Joshua Goldberg, who was attempting to incite Muslims to violence. Although they often “take the cake,” to be perfectly fair Judaics don’t have a monopoly on the victimhood hoax franchise. When exposed, these are typically back-page stories, meaning they get little exposure. But an excellent website called Fakehatecrimes.org tracks them by the hundreds. In the last few years, hate-crime hoaxes have gone parabolic, especially on campus. The only glass-half-full news and saving grace is that law enforcement appears to have little patience with false reporting. To further illustrate, a white social justice warrior in Ann Arbor pled guilty as charged to one count of a false report, a misdemeanor, in 15th District Court. Halley Bass admitted to the court that she fabricated a story about a strange white man scratching her face in downtown Ann Arbor on Nov. 15. There are high profile stories of bomb threats against Muslims students, such as this one last March in Montreal. This one implicated those so-called elusive “white supremacist” boogeymen once again. However, the subsequent investigation revealed another Muslim student was behind it. I’ve read through dozens of SPLC “hate crimes” and they are virtually all lies. The Muslim girls in particular seem to be very spirited liars. 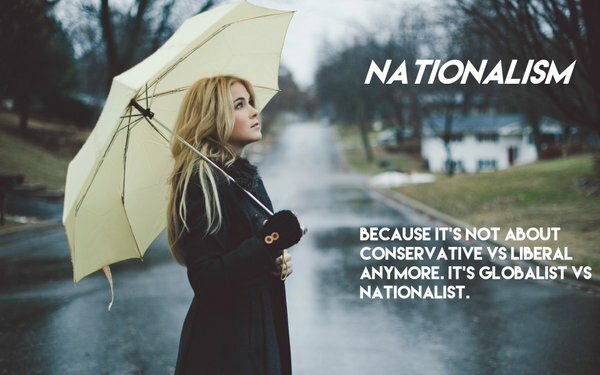 Since the election, there have been vivid stories from across the nation of Trump supporters tearing off Muslim girls’ hijabs — at the University of Michigan (since retracted), Louisiana State University (also retracted), San Diego State University (that too was retracted), the New York City subway (again: retracted) and the University of New Mexico (no witnesses, won’t reveal attacker’s name or report the incident for investigation). Homosexuals in particular tend to be involved in sometimes elaborate and dramatic fake victimization or staged deceptions. Anti-Latino graffiti at Elon University turned out to be big hoax, perpetrated by a student of the very ethnicity the message targeted. In Minnesota, racist, anti-Semitic graffiti was found on bathroom stalls at a high school. Officials identified the student responsible as “non-Caucasian” and having significant special education needs. An inordinate amount of this behavior involves demonizing white people, which is yet another heavily used tag at TNN. But whites aren’t immune to this deceit either. Most certainly, the case of Bill Cosby that TNN covered fits in here. In another case, a white New York firefighter is accused of setting his own house on fire and attempted to blame it on the Black Lives Matter movement. Jason Stokes, 41, pleaded not guilty to arson at Broome County Court after his house in Endicott caught ablaze in August. An excellent analysis of the false victimization stance is described in the following video. The meat of the matter starts at about minute 4:00. This is an enormous out-of-control social issue. The leader of world Jewry warned at Geneva, Switzerland that a current decline of overt anti-Semitism might constitute a new danger for Jewish survival. “Jews nearly everywhere are equal citizens, both politically and economically,” said Dr. Nahum Goldmann, president of the World Jewish Congress. And to think some folks out there actually take the “Holocaust” at face value. Talk about fake news. 6 million? Pfffttt Not likely….maaaaaybe 600,000 and 90% of those from typhus. U.S. investigators believe the suspect is responsible for the bulk of the threats against Jewish institutions in the past several months. Michael Kaydar, who never lived in the U.S., is facing charges related to the threats in Israel and there are no immediate plans for his transfer to the U.S. for prosecution. It would be fantastic for the FBI goon squad to get hold of this Jew douche’s IT equipment and tie any form of payment back to Soros. I won’t hold my breath.